Our now large (18 members) club has had a very active Fall. 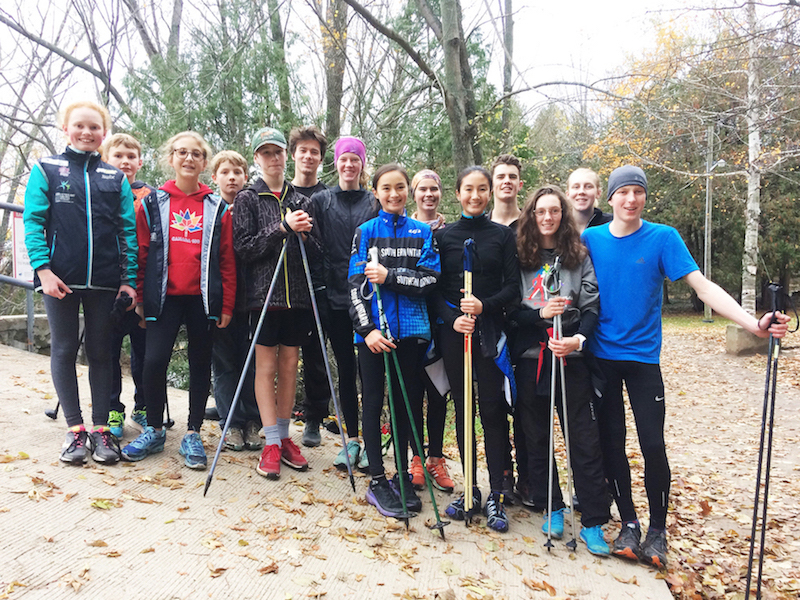 Training regularly at Sawmill Trails and Harrison Park as well as roller ski practices on whatever clean and quiet road will allow us to train safely. Our Love Your Skis event saw many pairs of skis readied for the season with cleaning, scraping, new hot wax and more scraping and brushing done by our Juvenile and Junior skiers. Money raised will help cover some of our costs at Nationals. Thank you to everyone who trusted us with their skis. Georgian Bay Nordic members also participated in the trail clearing event at Sawmill. Our first race is just one month away so we are very pleased to see snow on the trails already. We will be traveling to Temiskaming trails early December for a weekend ‘on snow camp’ to hone our on ski skills. Once again we will be hosting the Awesome Adult Afternoon Ski Lesson in partnership with Suntrail Outfitters. This is an excellent way to improve any aspect of your Nordic skills (downhills?, uphills? Efficiency on the flats?) or maybe you want to try Skate or Classic for the first time. We can help you! The event will happen January 12. Stay tuned to the Bruce Ski Club website for more details.